It has got presence, we will give it that. The edgy headlights, the strong belt line, near spot on proportions, and gorgeous wheels, all add to the car's attractive aura. But, the colour of the car we are driving just doesn't do it justice. Silver might be one the best selling colours when it comes to luxury cars, but on the new Audi A3 Sedan, it doesn't work. 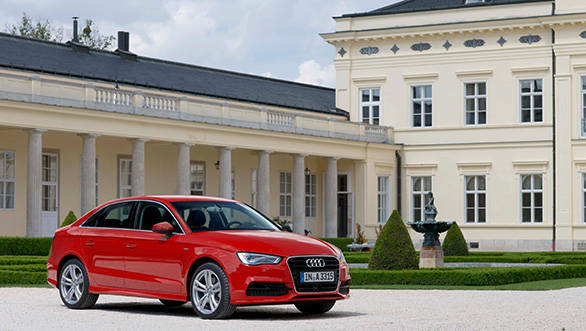 Red, would be more like it; it gives the A3 the vibrancy, the purpose and the sportiness, it is meant to convey. It is, after all, a younger man's car. And so, it's a red car that has featured on this page. The A3, which should be in showrooms in India early next year, is Audi's weapon of choice to take on the likes of the Mercedes A and B-Class, and the recently launched BMW 1 Series in India. There is however a significant difference; while the two Mercedes and the BMW are hatchbacks, the A3 that will make it to our shores will be a sedan. And that, we think, should give it an upper hand given our preference of sedans over hatchbacks, especially when the asking price is above ? 20 lakh. 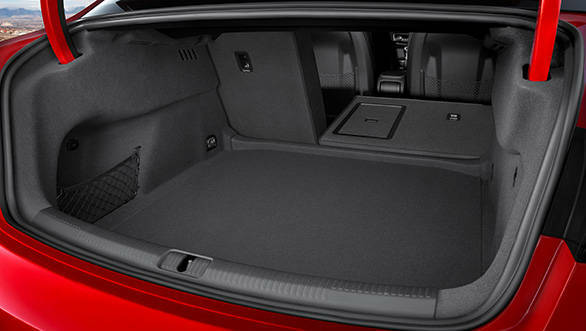 What will also work in the A3's favour, is its interior. It isn't as elaborate or classy as the insides of its bigger, more expensive sedan siblings, but it is very well built. The fit and finish is top notch, and the choice of material all round meets the expectation one has with a car that sports the four ring logo. The operability, again, leaves no room for complain. Every button, toggle or dial, clicks with precision and tactility that reeks of engineering prowess. And the car we are driving, the S Line trim, is well specced too. It comes with Audi's Drive Select module, the MMI system, a sunroof, two zone climate control and a multifunctional steering, all of which will make it to the car in India as well. Additionally, the top of the line A3 Sedan in India will also sport electrically adjustable seats and leather. However, expect a strip down version as well, much like the A-Class diesel, as Audi works towards getting an aggressive entry-level price tag in India to increase walk-ins. Engine options will be limited to two back home, at least to begin with. 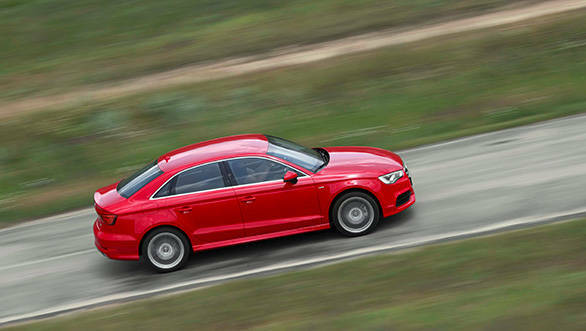 Internationally, the A3 Sedan can be ordered with one of four engines - two petrols and two diesels. The petrols include the 140PS 1.4-litre TFSI and the 180PS 1.8-litre TFSI, while the diesel options include the entry-level 105PS 1.6-litre TDI (the same that powers the Volkswagen Vento), and the familiar 2.0-litre TDI with 150PS of max power. We expect the 1.8-litre petrol and the 2.0-litre diesel to make it to India first. We drove the 1.8 with the S-tronic automatic transmission. The engine is refined and nice sounding. It's a joy to rev too, and the harder you rev it in each gear, the more enjoyable it gets. With 180PS and a kerb weight that measures less than 1300kg, this A3 can hit 100kmph from a standstill in less than eight seconds, which by any standard is respectably fast. As far as the gearbox goes, as is true with all dual clutch auto 'boxes to come from the Volkswagen Group, the S-tronic on the A3 too is alert when it comes to shifts, and is equally home ambling about at slow speeds as it is when given the stick. It is a seven speed unit which comes with steering mounted shifters and a Sport mode. There isn't much we can comment about the ride quality of the car just yet given the roads we drove on in Munich were well surfaced. 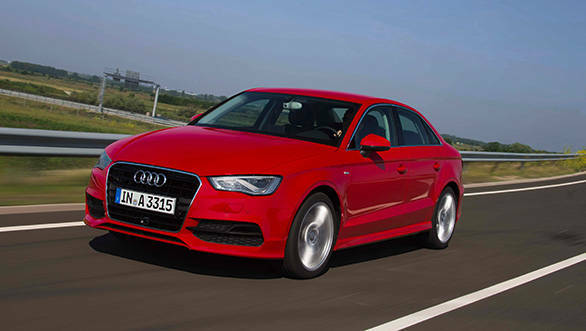 What we can tell you though, is that the A3 is a nice handling car. Its steering still feels dead and light as on most other Audis, but at least it is precise. Moreover, given the relatively smaller size of the A3 and its 51:49 weight distribution, it turns in well, tyre grip is good and unless you steer too sharply or get on the throttle too early, there isn't too much understeer to be dealt with either. But, it isn't exactly too involving or fun to drive; we'd rather term its handling as safe. So, there you have it then - if you are looking for a good looking and well built entry level luxury car, and don't mind the lack of driver involvement, the A3 Sedan should make for a good choice. However, whether it is truly worth buying or not will be decided once its price and equipment levels are revealed at its India launch next year. But, do remember to order yours in red.